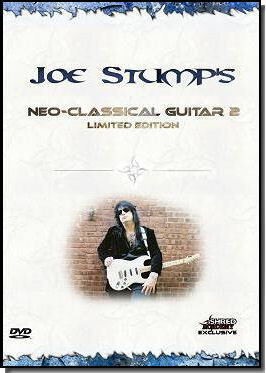 Limited Edition 'Neo-Classical Guitar 2' features Joe Stump demonstrating more advanced techniques for lead guitar, using Ritchie Blackmore's 'Neo-Classical Shred Fest No.2 ' as an example and performance piece. The 'Neo-Classical Guitar 2' DVD is undoubtedly Joe Stump's best instructional release to date, packing over 90 minutes of new footage onto a single disc. Fans of Joe's music and previous instructional releases will not be disappointed, as once again Joe offers priceless insight into his unrivalled fretboard dominance. "If shred is dead, then Joe Stump is Dr. Frankenstein. This Berklee School of Music professor and all around badass has set out to spread his six-string street smarts and fretboard wizardry to the masses with this latest edition to his Neo-Classical line of guitar videos. Three-chord hacks and poseurs beware; this lesson is for seasoned soloists only. Prof. Stump pulls no punches and lets the fury fly right away with his opening demonstration of the techniques to follow. I’ve been playing for a decade and a half now and the first five minutes of this DVD almost made me sell my axe and take up cross-stitch. However, I swallowed my pride, tuned my fiddle and put my learning cap on and I’m better off for it today. The lessons are fairly easy to follow as the laidback Stump sits in front of a wall of Marshall cabinets demonstrating the lick of the minute first at 90 miles an hour then again at his top speed of 590 MPH; each run his followed by Joe’s trademark ‘COOL!? !’ as if to ask the viewer if he had mastered the idea yet. As effortlessly as Joe pulls off these near impossible licks, his heavy South-Bronx accent and charismatic personality made for a relaxed atmosphere and eased up the learning process. As a bonus treat, Stump takes the viewer through Ritchie Blackmore’s “Neo-Classical Shred Fest” and one of his own tunes too. This DVD is highly worthwhile for shredders of the intermediate to advanced levels, but you better be ready for a challenge, Stump-style." Also available in the 4-disc set. THIS VIDEO IS AVAILABLE AS A DOWNLOAD OR DVD, PLEASE MAKE YOUR SELECTION BELOW. The download is 841mb in size, and in .mp4 format. The DVD is an additional $5 to cover shipping.